Basically it is a long plastic mesh tube that is filled with a modern waste material called “wood chippings”. If you hear chainsaws and a chipper buzzing away in your neighbourhood, then there is a good chance of some FREE wood chips. 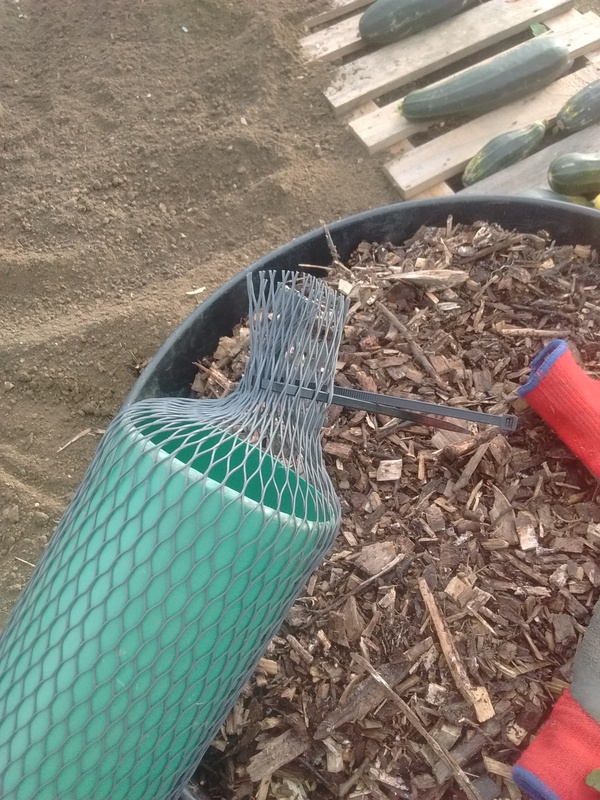 The open ends of the tube are tied off using cable ties to create a long wood chip filled sock that we are going to use as a soil retaining edge to our semi-raised deep beds. 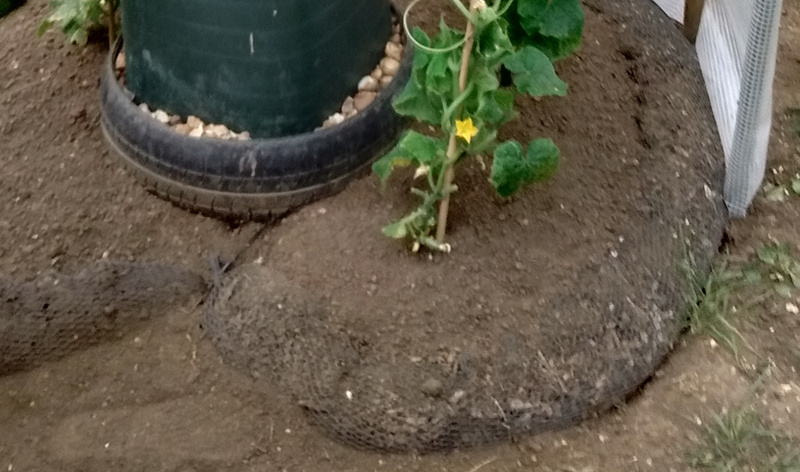 But again it also has a dual function which is to introduce mycorrhizal fungi into our semi-raised beds to help feed our greedy woody annual vegetables through a symbiotic relationship. 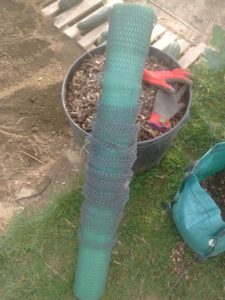 What use is a “Wood Chip sock” on an allotment ? 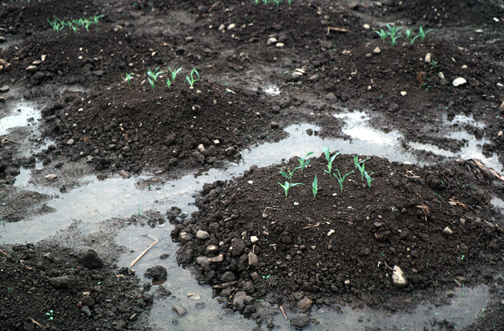 This image of the mound style of planting that the native american tribes adopted was popular for a time in the UK in the 1970’s. However our grey and rainy little island would soon wash these heaped mounds flat. This is where these wood chip socks can be put to use as a soil retainer on these mound type beds. 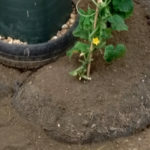 With this approach the water and some soil runs into the “wood chip sock” edging but still retains its mounded shape for most of the growing season. 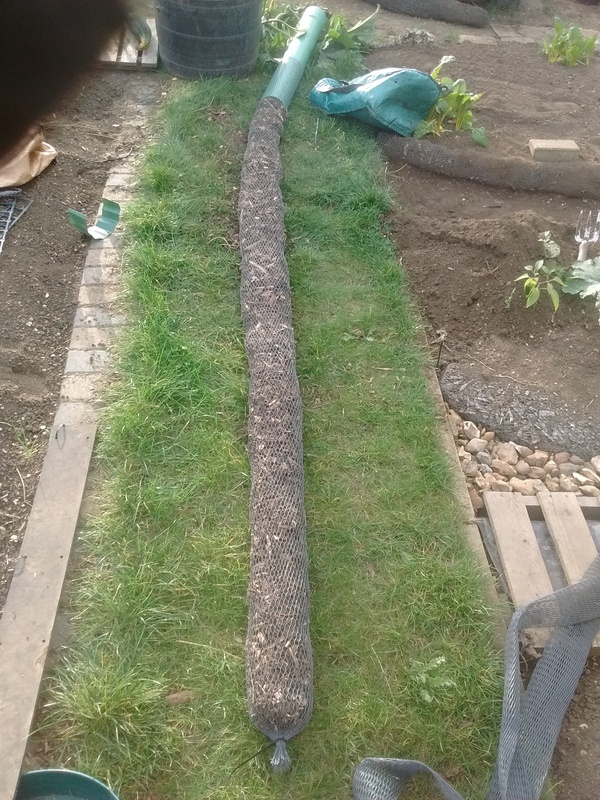 What are the advantages of these Wood chip socks to edge beds vs boxed-in raised beds. 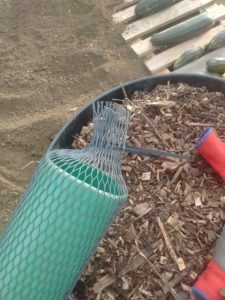 Costs less per metre for plastic mesh vs wood from DIY store. Is easier to construct and does not require expensive tools or heavy lifting to construct (pair of scissors and filling tube only). 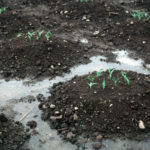 Stops raised beds being washed away by British weather. Can be positioned to fit any type of raised bed shape that can be imagined. Helps to retain moisture in the raised bed, reducing watering by hand. 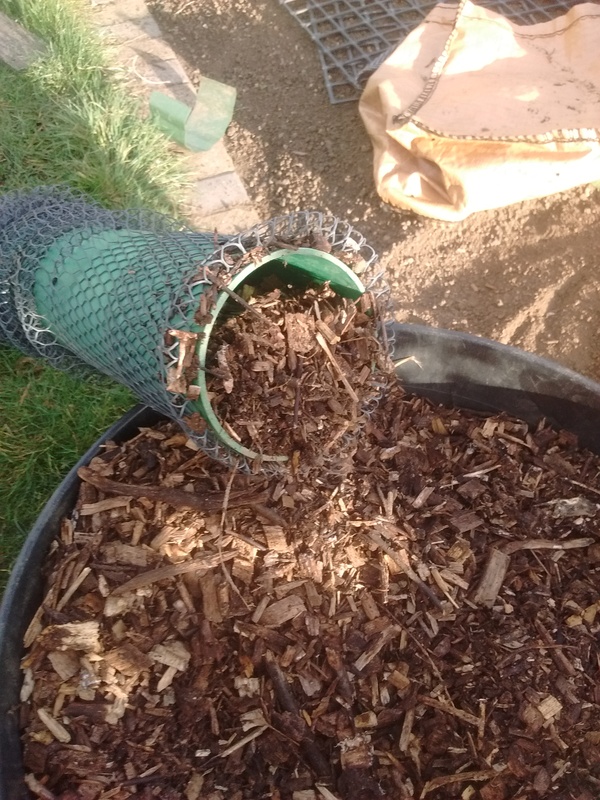 After a year the majority of the wood chips should have rotted down. 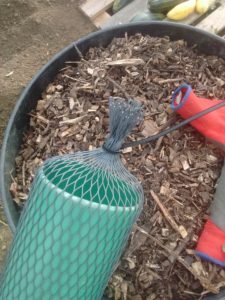 The sock can be emptied and refilled with fresh wood chips. Mycelium fungus from the rotting wood chips have been proven to help nutrient uptake by woody vegetable plants due to a symbiotic relationship. 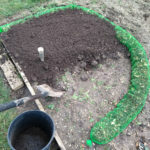 A 3m long sock will edge a 1 metre-in-diameter horseshoe shaped semi-raised bed . 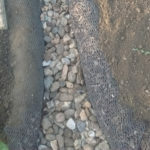 UV stabilised plastic mesh will not rot and has shown no degradation after 2 years. Where can I get the protective mesh Sleeve from ? It roughly works out at 50p a metre. First we stretch the mesh tubing onto our 3 foot section of pipe. Sliding it fully onto the pipe by rucking it up. The full 3m length of mesh is now completely on the tube. Thread the cable tie through (under & over) the mesh holes until you’ve gone all the way round the mesh. Zip up the Cable tie and tie the excess in a knot around the tuft a few times. Saves having to snip off the plastic. Also makes it easier to undo for next years refill. 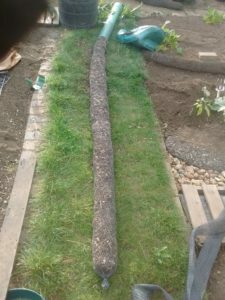 Firstly fill the 3 foot tube section with wood chips. 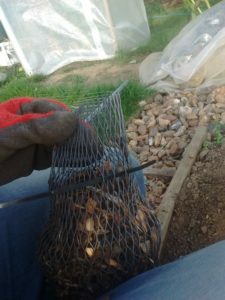 Then by holding the tube vertically the wood chips will start to drop into the mesh. Grip the tube in one hand and some of the rucks in the other hand and using a jigging motion to lightly ram the chips into the sock. Repeat this 3 or 4 times to completely fill the “Wood Chip sock”. A completely filled Wood Chip Sock (3m). Now all that remains to do is tie off the filling end. Thread the closing cable tie through the last couple of inches of the plastic mesh tubing again in an ‘under & over’ fashion. Zip up the cable tie and tie the excess in a knot around the tuft a few times. Finally one completely filled wood chip sock ready for edging a border. Its easier to fill the sock as close to where its going to be used and then drag it into its final position rather than trying to pick it up. 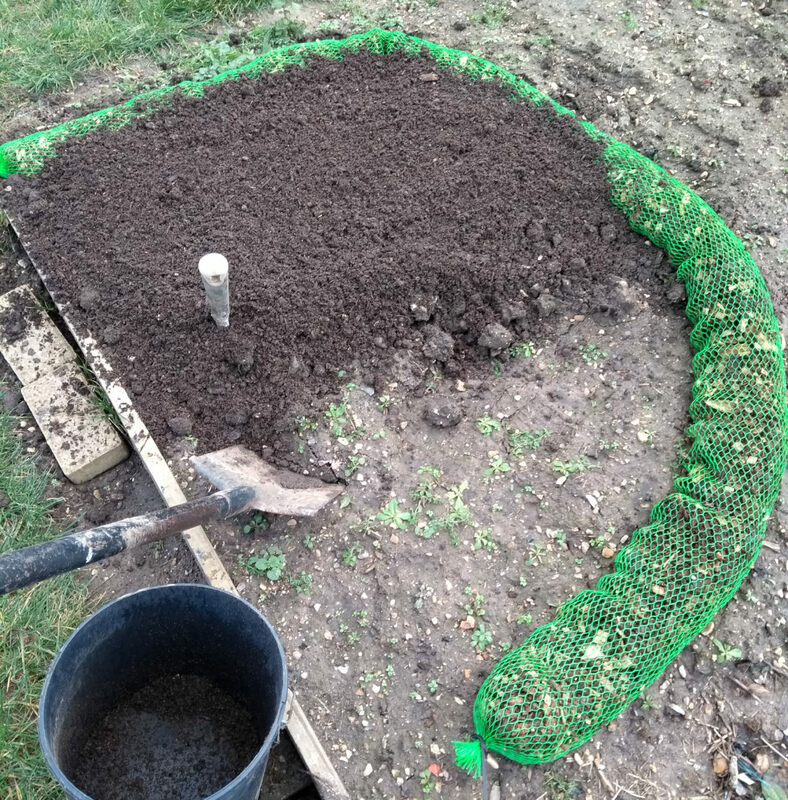 Since adopting this border edging method the plants that grew close to the wood chip sock appeared more robust with higher yields. 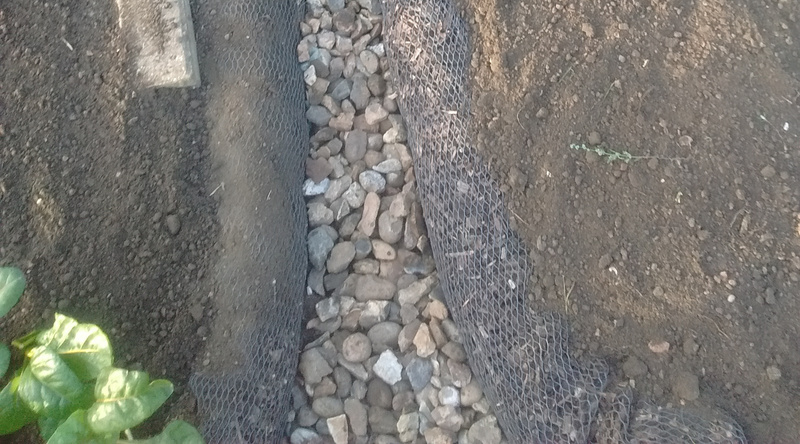 After six months of acting as a border / walkway some of the edging socks had become a little flattened. All you do is lift them out of the soil and flip them over and fluff them up a bit and there back to normal. When turning them over you can see lots of white micro fibres that have grown through into the raised bed. In the allotment gardening world there is a heated discussion regarding the use of “wood chips” as a mulch with a belief that it can cause problems with fungal levels in your soil as well as stripping nitrogen. I believe that wood chips contained within this plastic sock limits some of these negatives. The limited contact patch that the sock has with the soil and with the other 60% exposed to the air (outer part of the sock) may mean that more nitrogen fixing than nitrogen stripping may be going on. Perhaps this could be a nice project for a horticultural student. Hopefully in the future a jute or biogradable mesh tube version will become available. You may even find a 3m easily packaged little roll being sold for a £1 in Poundland or Wilkos, fingers crossed. If the idea becomes popular the price per metre should start to tumble.